Hello everyone! I know some of you are waiting for my El Nido photos. But for today, I just want to share first what outfit I wore during our Day 1 island hopping activity. I have been contemplating on doing a pink and yellow number when I saw this pretty and budget-friendly top from Bread and Butter at Edsa Central. If I remember it right, I bought this just few days before our trip and I already had it in mind to pair it with this equally striking yellow skirt that I got from Forever 21 last year. I've been very adventurous with prints and colors this year and coming up with this outfit really made me happy. My friends/officemates who were with me in El Nido knew that I regularly blog about clothes and things about fashion so they were very supportive when I ask them of photos the entire trip (thanks so much again friends!). And I was really amazed with how the photos came up even though I am not really good at posing in front of the camera haha! I just love how the colors of my clothes pop up against the beautiful view of the nearby island and the water. Many thanks to my skilled photographer during the trip, Jun G. ! The outfit is very beach friendly in my opinion. You can just walk around the small town of El Nido wearing the combo as you shop or eat at a restaurant. And when it's already time to hit the water, you can just opt to remove the skirt and feel more free to enjoy the shore with just the knitted top and still feel chic. Now I am thinking if I'll buy the blue version of this top from the said shop haha! Anyway, I hope you like the outfit that I shared today. I always love to hear your thoughts so feel free to leave comments. Wonderful day to all! Sally, the picture is so perfect! 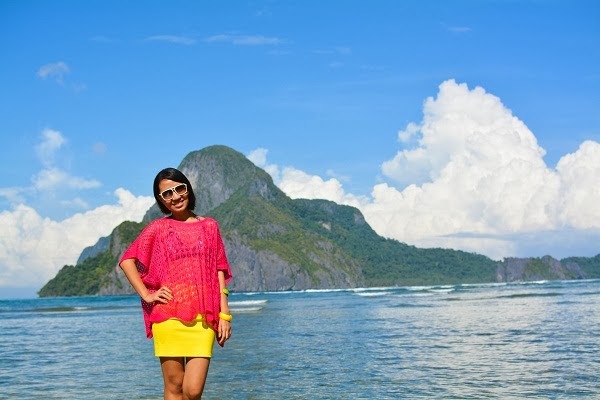 Lahat maganda, your outfit, the backdrop and you :) Yes, can't wait for your El Nido post.